Beautiful and fun! This kind of chess piece so calm and stylish. 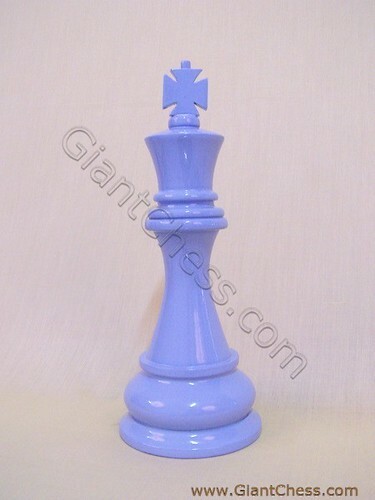 King chess piece polish in blue bell color, perfect for house decoration for indoor and outdoor. We provide in a set, so you can get this blue bell chess in a set. Kids love this chess set. They like to learn something new and interesting. You may teach your children about chess using this kind of chess piece. Sure that they will learn fast and enjoy it, because the chess piece so attractive. You can also use it for decoration furniture in your living room, dinnig room, library, at school and another space. If you want to put it at garden or backyard, do that. Because our product has made from best quality of Teak wood, so the products are very durable and qualified. Or may be you want to have chess set in other color. We provide in variety colors, such as red, white, black, silver, and many more.